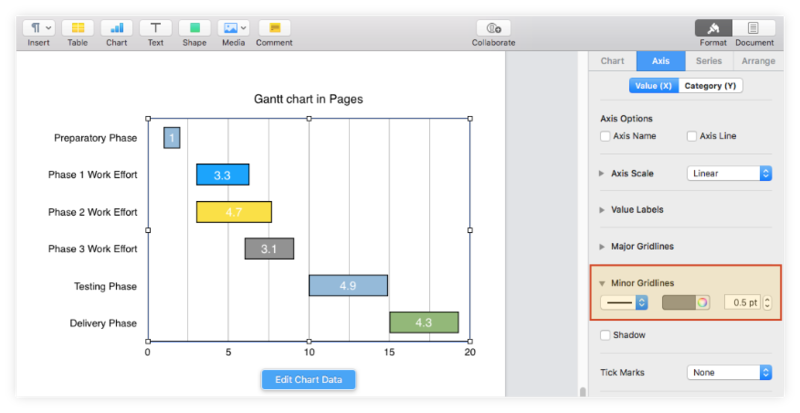 This step-by-step Pages Gantt chart tutorial demonstrates how to make professional Gantt charts inside the popular word processor for Mac. 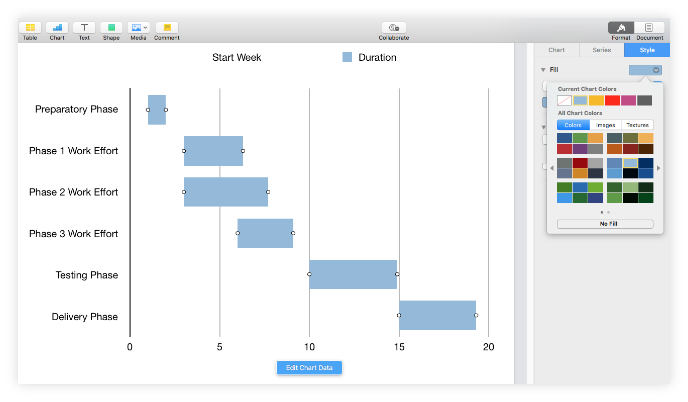 Mac users wanting to visually present plans or schedules in Pages can tweak a default 2D Stacked Bar chart to build a basic Gantt chart. 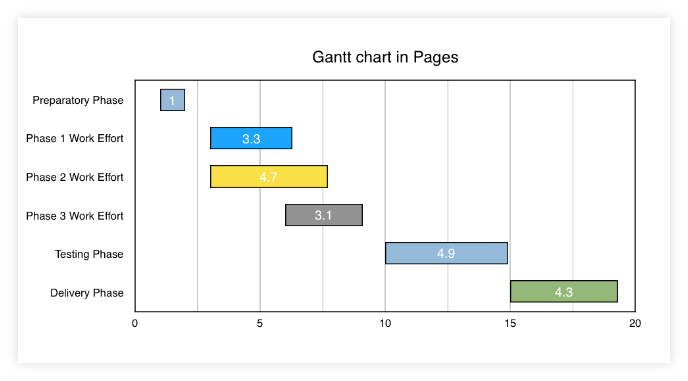 Because formatting the graphic in Pages can become time-consuming, those who need to regularly create and update such visuals may find it simpler to use a dedicated Gantt chart maker instead. 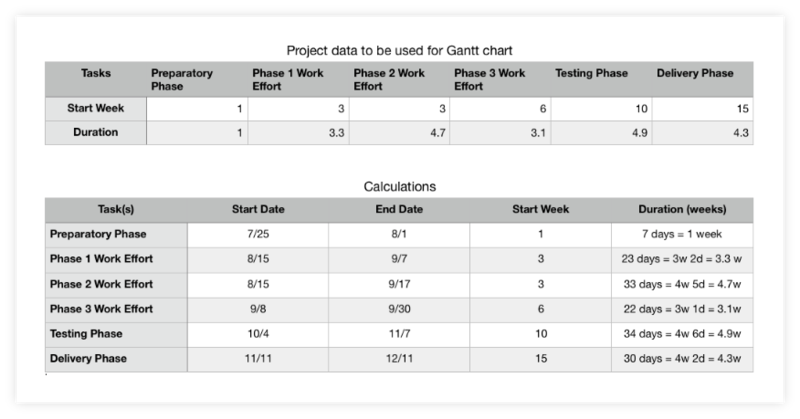 This page will show you two ways to get your Gantt chart: either build it manually in Pages, or use the online Gantt tool called Pincello, which generates a professional visual automatically and lets you download it as a PowerPoint slide for easy sharing. Open Pages and double-click on Blank Landscape under the Basic category of the template gallery. This is recommended for an optimized layout of your presentation. Add a table to your document by going to Insert → Table on the Pages ribbon or by clicking on the Table button on the taskbar above your page. 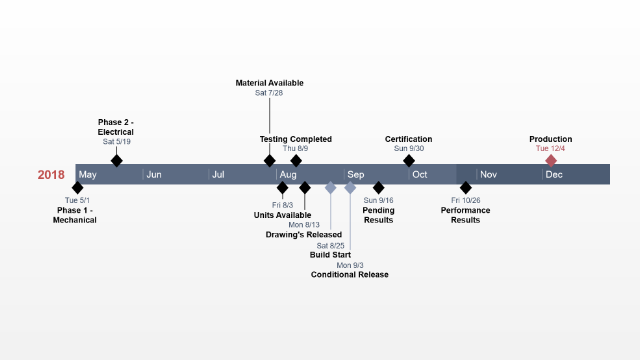 List the main phases or tasks of your project in the first row of the newly inserted table, as shown in the picture below. You'd keep their names short and concise to make sure they'll fit well on the graphic. 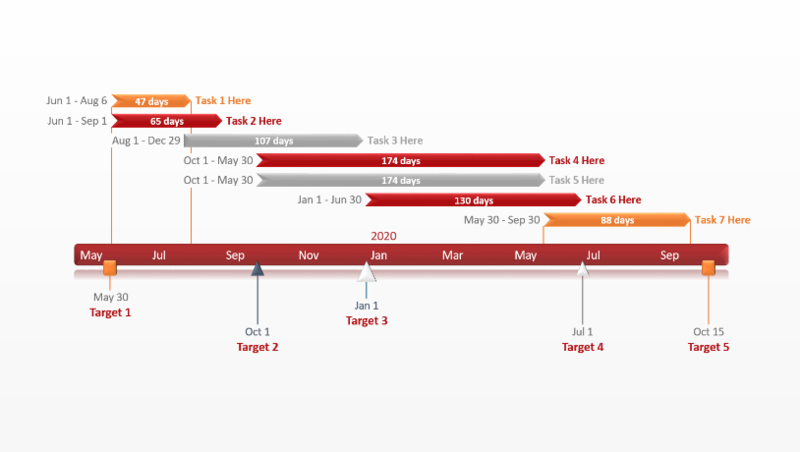 Use the second row to enter the start week for each of your project phases, setting the first task (which begins in week 1) as the reference point in determining the beginning of the remaining ones. See the following image for a better illustration of how I set the start time series for my chart. Now that you have sorted out your data, you can start building your graphic. Go to Insert → Chart on the Pages ribbon. Click on 2D Stacked Bar from the menu that appears. Select and copy (Cmd + C) all the rows of your project data table. 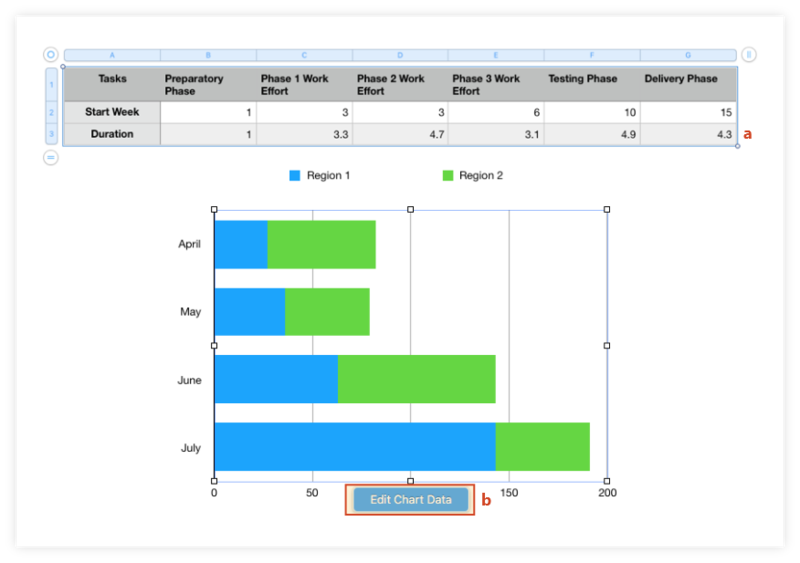 Click on the Edit Chart Data button that appears after selecting the chart area. Select the first cell in the top-left corner of the Edit Chart window that shows up and paste the copied items. 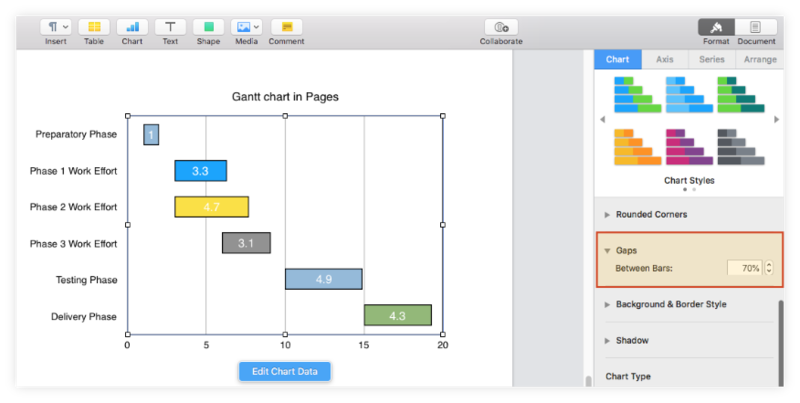 Pages will replace the placeholder data with your own and the graphic will be instantly updated to display the new details. Double-click on any of the blue bars of the graphic, which will select the whole series. 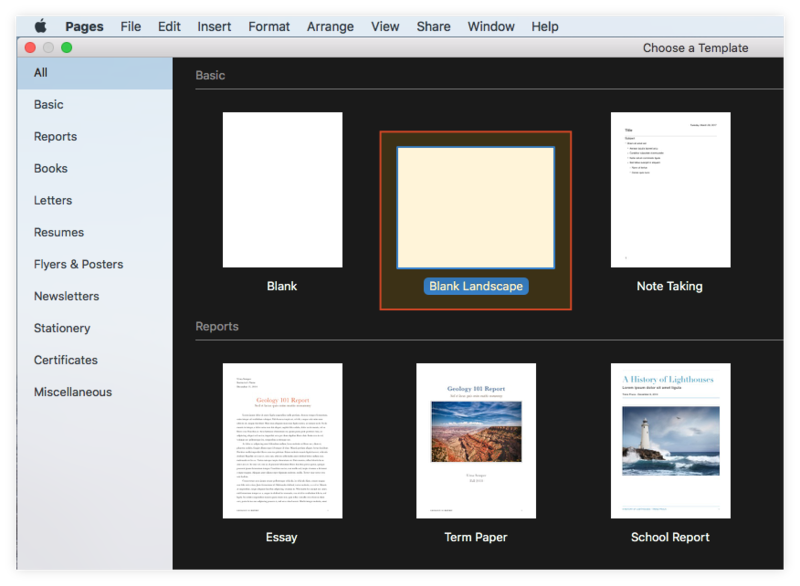 Go to the Style tab of the Format pane on the right side of the Pages document. 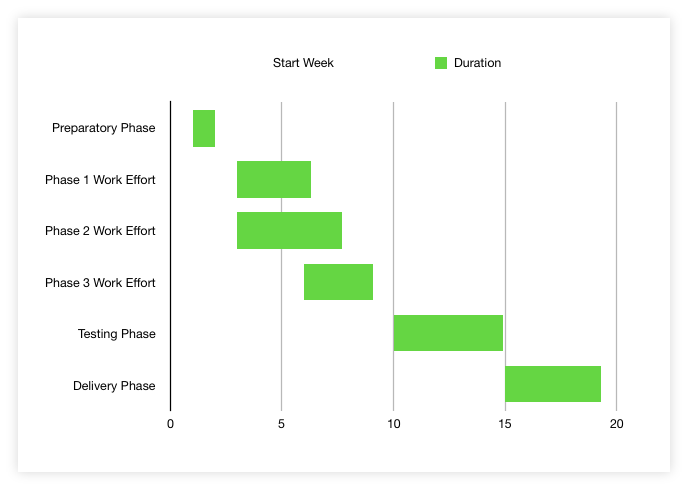 With your Gantt chart properly set up, you can now make further customizations to add meaning and help it stand out better. 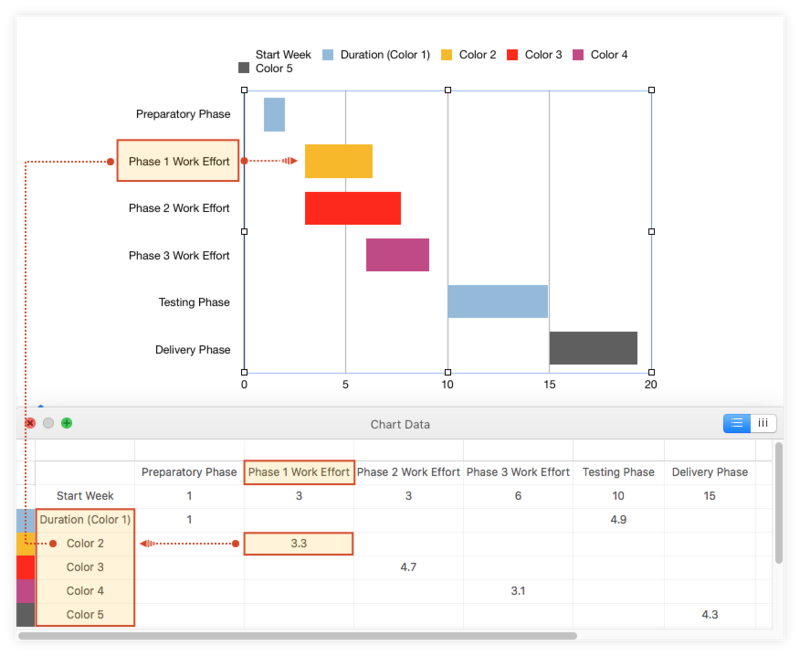 If you want to recolor your tasks simultaneously, click on the chart area and then on any of the bars to select all of them at once. Then go to the Style tab of the Format pane and use the color indicator next to Fill to choose a new hue. In my example, I picked a pale blue. i.Insert a few extra rows beneath Duration, which you can name Color 2, Color 3, Color 4 and so on. As you can see in the image below, the newly added lines will generate different hues for your graphic that you can further customize afterwards. 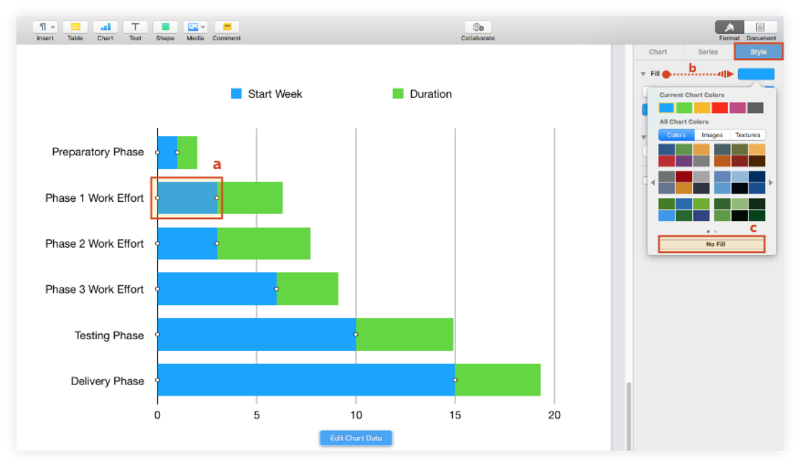 Note: As the image above shows, the tasks that have their Duration values on the same row are considered as a single series with the same color (e.g. Preparatory Phase and Testing Phase), which means they'll all be customized at once. The tasks with their duration values distributed on different rows are considered distinct series that can be customized separately - as shown in the following step. While in the Style section, you may also want to apply a few effects such as strokes and shadows. Because I felt shadows were a little distracting and made the graphic more difficult to follow, I chose to add only a simple black outline to my task bars using the Stroke feature. 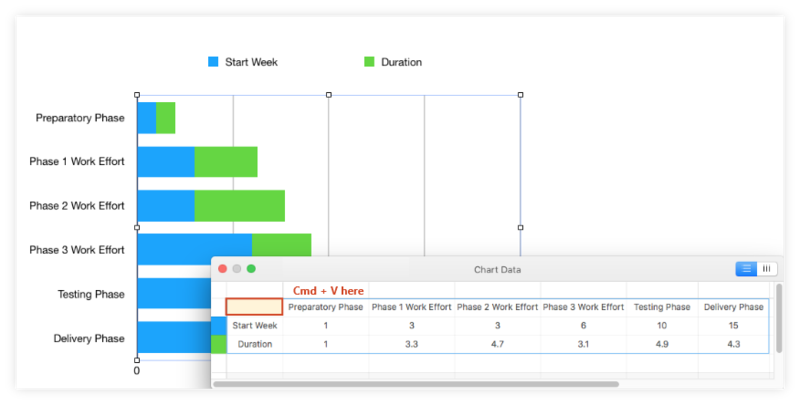 To display your tasks’ duration on the Gantt chart, select all the bars (Shift + Click), go to the Series tab, and choose Number from the dropdown menu under Value Labels. To change the placement of the value labels on the task bars, use the Location feature. In my example, I chose to have the labels displayed in the middle. Add titles and borders: Tick the boxes for Title and Border under Chart Options. I also unchecked Legend as I considered it redundant in my case. Customize fonts: Use the options under Chart Font to modify the font type and size for the entire graphic. In my example, I changed the font from Helvetica Neue to Helvetica and I increased it a bit. Note: You can customize the task descriptions or title independently by double-clicking on them and making the desired changes from the pane on the right. 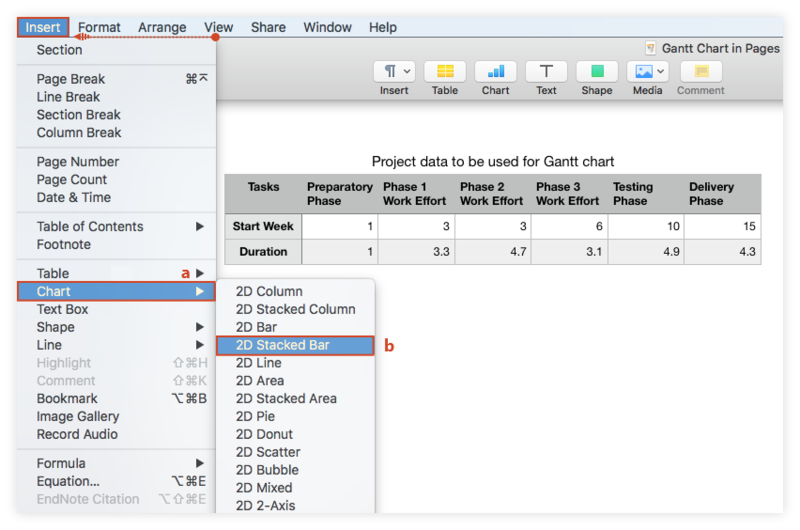 Adjust the gap between the task bars: Use the up-down controls under Gaps to increase or decrease the space between chart bars. I increased it from 40% to 70% for my graphic. 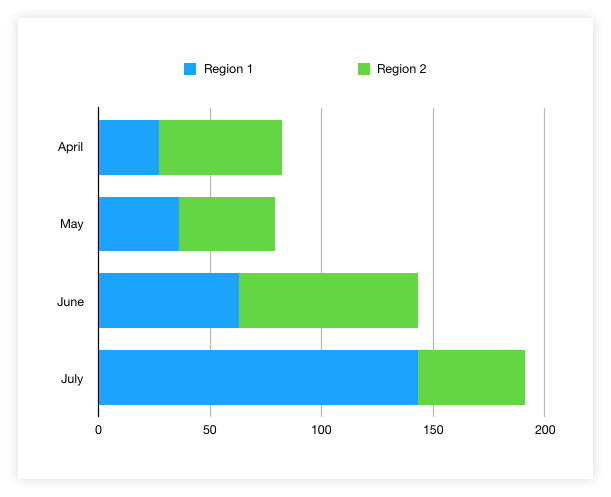 Add more vertical lines to the chart: Click on the Axis tab of the Format pane, go to Minor Gridlines, and select the type of gridline you want to use. For my graphic, I used a straight grey line. 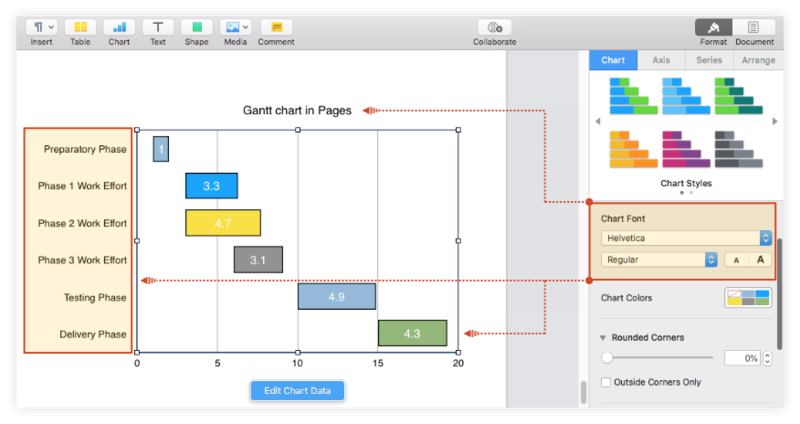 Apple's Pages does let you build a Gantt chart, but the formatting process can become cumbersome especially if you need to regularly create and edit such visuals for recurrent communications. 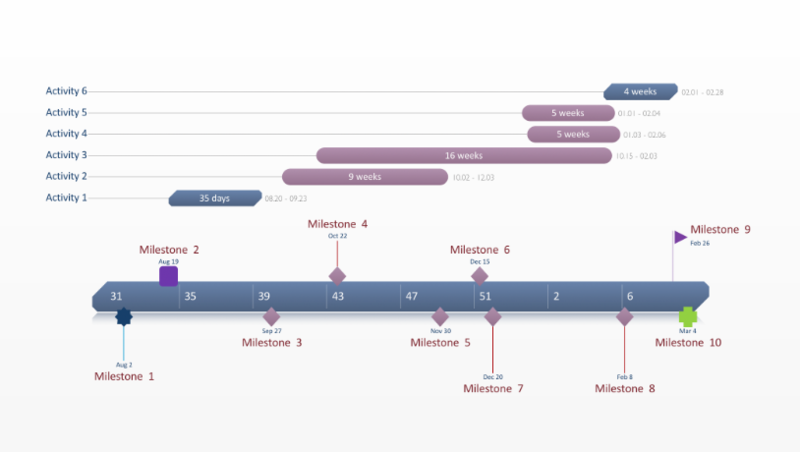 Below I'll demonstrate how to make professional-looking Gantt charts more easily using Pincello. Allowing you to automatically create an eye-catching graphic directly from your browser, Pincello also lets you update it quickly and download it as a .pptx file or .png image. To get things started, access the free online tool here and carry out the following steps. 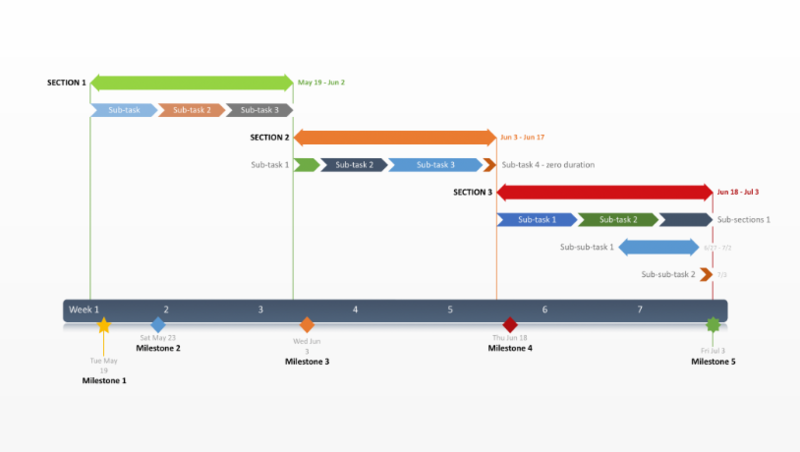 To start building your Gantt chart, click on Timeline from scratch from the web tool's New tab or choose one of the templates available. 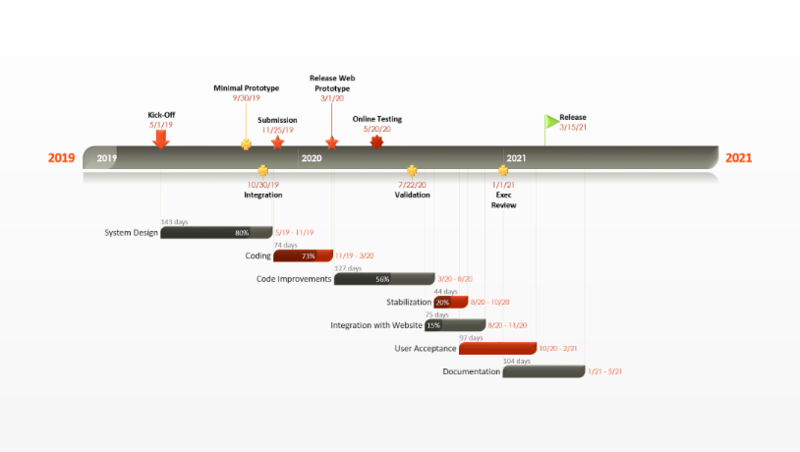 In my case, I went for the first option, so you can see how to make a Gantt from top to bottom. 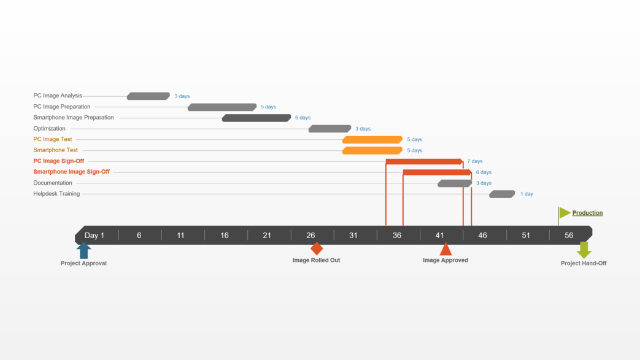 Selecting the Timeline from scratch option will open the Data View, where you can add and edit data. Use the Data View tab to list your project’s tasks and their due dates and make a few styling choices such as choosing the shapes and colors of your items. Pincello will instantly transform this data into a graphic and display a live preview of it on the right. 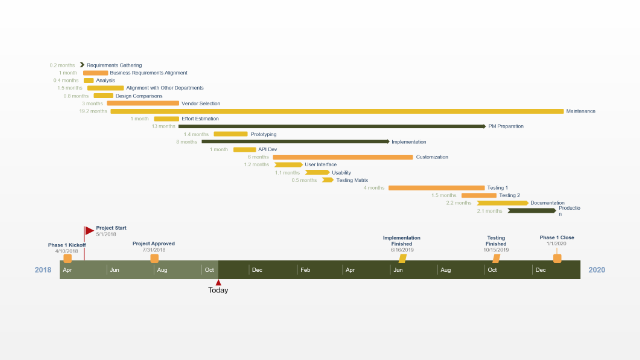 When you’re ready, open the Timeline View to see your graphic in full size and start customizing it. You can do this by either clicking on the preview image or selecting the Timeline tab on the Pincello ribbon. 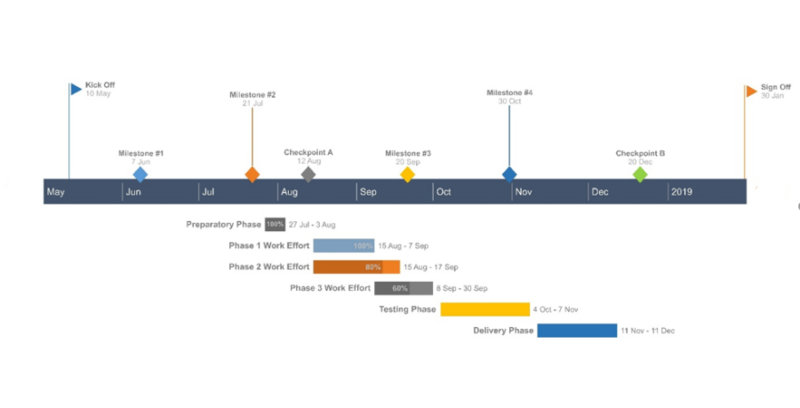 At this point, you can customize any detail on your newly created Gantt chart with just a few clicks. 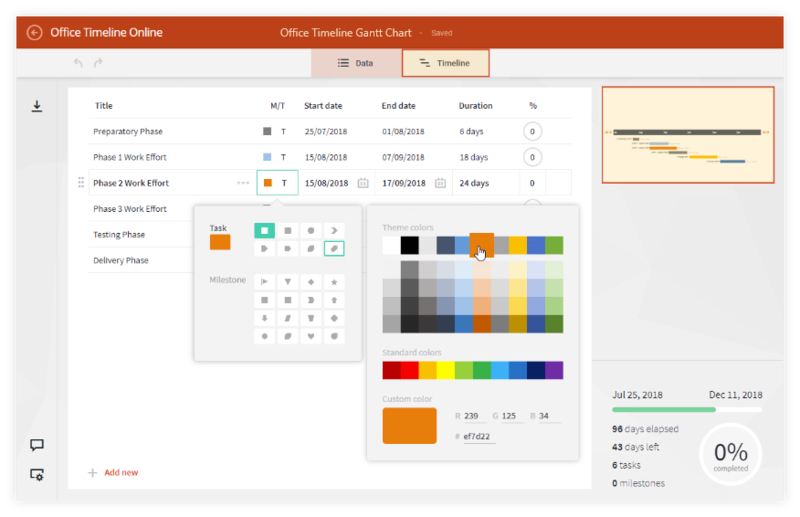 From the Timeline tab, you can change any color, shape and font, adjust the tasks' position and spacing, or choose to show details such as Task Duration or Percentage Complete. Whenever you want to add more tasks, you can instantly switch back to the Data View and enter their details. 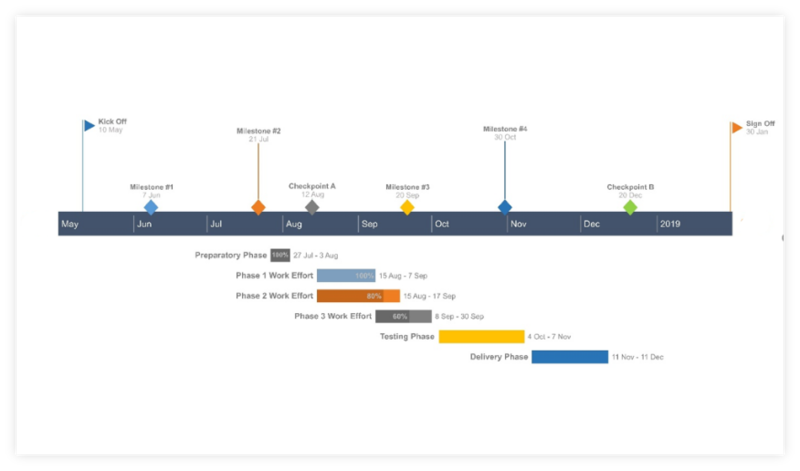 You can see on my final Gantt chart below that I have included some milestones too, which will help in tracking my project. 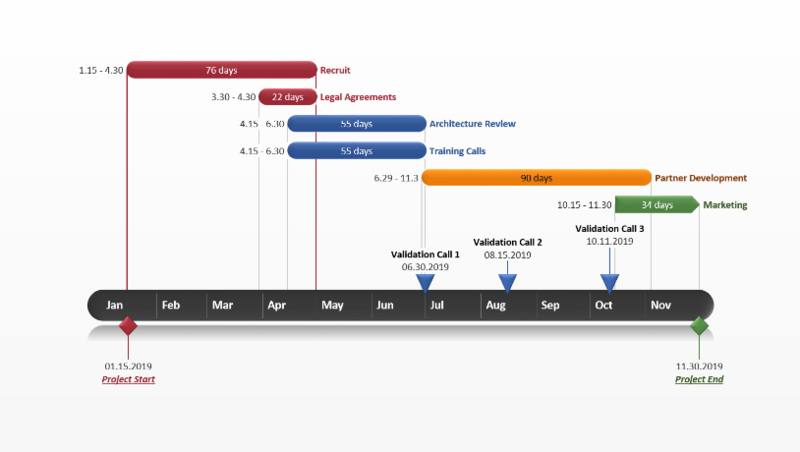 If you have a free Pincello account, the Gantt charts you make will be instantly saved in the cloud, which means you can return to them at any time and adjust them as plans change. 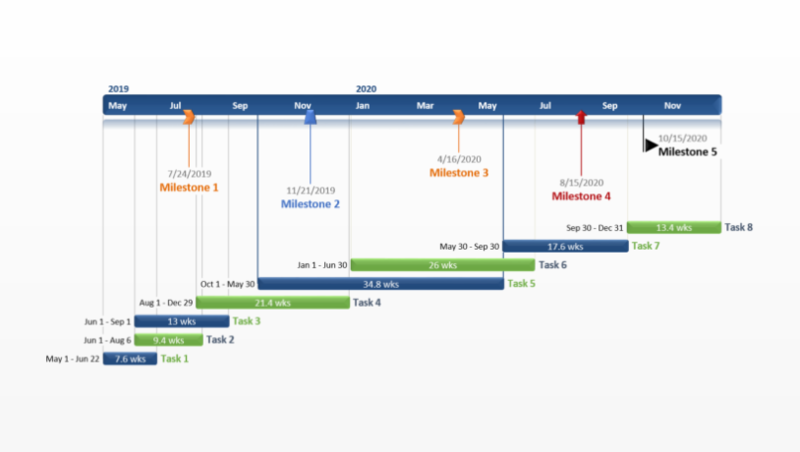 The Timeline View lets you update task and milestone dates right on the graphic with a simple drag & drop, while the Data tab makes adding and editing items fast and easy. 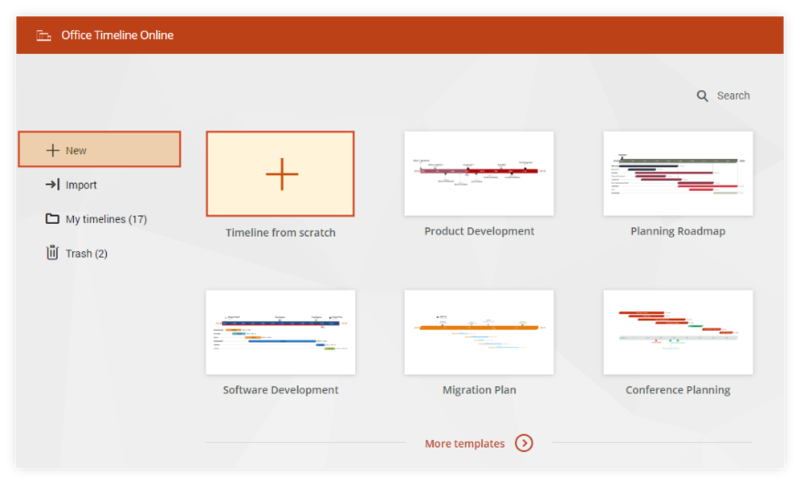 Once finished, turn your Gantt chart into an editable PowerPoint slide so you can easily include it in presentations.